Cakna Siswa Timur: CST SOKONG LYNAS!! For this time, CST try to explain to you all about LYNAS. For sure everyone feel shock why CST suddenly make a post in English right? That not impossible for everyone as a student "Mahasiswa" to write or speak in English. So, for today post, CST will share about "FALSE Allegations and the FACTS" about LYNAS. The issue of Lynas taking advantage of weaknesses in Malaysia’s Law is not true. Malaysia’s Law on radiological safety and health is at par if not stricter than any those used internationally. Lynas has never proposed the used of any China’s standard. There is no such Australian law or even other international law. The nearest town to Mt Weld happens to be laverton which is 35km away. This distance has been misquoted by the opposition as the Australian requirement. Lynas did not and has never brought in any lanthanide concentrate into Malaysia. Lynas respects all legal requirement of the government of Malaysia. The logistical trial run carried out by Lynas using an empty container was mislead by some as importing the lanthanide concentrate. a) The investment climate was conducive and competitive. B) of the optimum resources including infrastructure required to support her operation. Gebeng, in specific, has the required port facilities, reliable support facilities (utilities), technically competent work force and reliable utilities. c) of clear regulatory requirements critical to investment decision. NO, Lynas was never chased out from Terengganu. In fact Lynas met environmental requirements of the AELB and DOE. Lynas is NOT a nuclear plant but simple chemical processing plant operating at atmospheric pressure and ambient temperature. Therefore, there will be no fire or explosion that will cause radioactive dispersion and contamination into the environment similar to a nuclear plant accident. 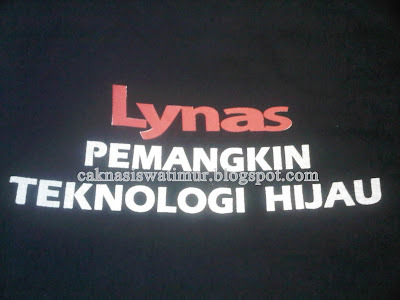 Lynas is NOT the same as ARE. ARE uses monazite as raw material. Monazite extracted from tin tailings contains 43 times more radioactivity than Lynas raw material. ARE’s residue is also 48 times more radioactive. Lynas original site is about 2 m above the water table. The site has been prepared by replacing with 1.4 m local fill making the site now 3.4 m above the water table. The RSF is built on top (not excavated!!) of the new site. The base of the temporary storage facility is 0.75 m thick, making its base about 4.15 m above the water table. The wall of the storage facility is 9 m high. How does Lynas prevent radioactive material from polluting the water? a. Thorium is not soluble in water and thus can be precipitated and separated out. b. HDPE liner will prevent leaching. c. Clay (layer below the HDPE) has very low permeability to water and that will further prevent any possible leaching. d. Thorium has strong affinity (stick strongly) for clay, thereby further reducing leaching. e. An under liner leak detection system (ULLDS) monitors and detects any possible leak. f. Sampling of water quality to meet 34 parameters specified by DOE and AELB prior to discharge. g. Underground water quality is monitored routinely. How does Lynas prevent radioactive material from polluting the air? a. A 5-stage waste gas treatment plant installed to ensure release of clean air specified by DOE. c. Aerosol Monitoring System (AMS) installed on site and at IPD Kuantan to monitor radiation level in the air. d. Continuous Emission Monitoring System (CEMS) installed at the stack to monitor quality of air emission. e. AMS and CEMS are monitored real-time and online. How does Lynas prevent soil contamination? a. All process area are built on bunded secondary containment concrete structure. Any acid spill will be contained in the bund and will not come into contact with the ground. b. Residues are stored in an engineered Residue Storage Facility (RSF) to prevent contamination of underground soil. Lynas carries out RIA in accordance to all regulatory requirements and IAEA standards. RIA is an assessment of total dose and risks to critical targets (e.g. workers and public) calculated based on all possible exposure pathways. This means that both external and internal exposures were already considered. Radon and Thoron are radioactive gases with very short half lives and will not travel far. This means that once formed these radionuclides will immediately transform into solid and will never travel any significant distances from the plant. Aerosol Monitoring System (AMS) installed on site and at IPD Kuantan to monitor radiation level in the air. Radiation is all around us. Some areas in Perak, Selangor and Langkawi have higher than the average Malaysia’s level of radiation but posed no hazardous consequences. Radiation is also used in the medical field. FDI value of RM 2.5 billion with annual OPEX of RM 600 million. Total contracts for Malaysian contractors is RM 1,168 million of which RM 513 million is for Kuantan contractors. No residue will be stored permanently on-site. Even though the RSF is a temporary storage facility it was designed and built to international standards of permanent storage facility. Firstly, the allegation implies that Lynas is extracting or concentrating the Thorium in WLP. Lynas operation is neither extracting nor concentrating the Thorium content. Secondly, although the volume is large the concentration remains the same. From the very beginning, Lynas has declared to the AELB that its raw material and WLP contain low level naturally occurring radionuclides. Lynas has and will comply to Malaysia and internationally safety standards. No such law in Australia. 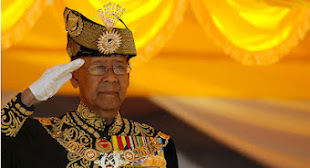 Waste will be stored in accordance with Malaysia’s regulatory requirements. Lynas Malaysia is fully manned and managed by Malaysians with five Rare Earth experts from China and India. AkzoNobel is a chemical company which manufactures resin but not apply the resin lining, nor certify the work. Hence Lynas made a business decision to change the contract services for integrated resin sourcing, application and certification of the concrete tanks to Trepax who has over 20 years experience in the petrochemicals industry across Asia. Trepax is applying a vinylester resin to meet international industry standard “Derakane 411” from the worldwide leader in Vinylester. It is a common practice in Petro Chemical industries that pipes need to be tested according to international standard to identify leaks and rectified accordingly before being put in service. The pipe is tested 50% above the design pressure or 70% above the operating pressure. Prof Ismail Bahari has resigned from AELB board before assuming the role of Lynas ‘ Radiological Safety Adviser. He attend only 1 board meeting but matters pertaining to Lynas license application was not discussed in that meeting. So now,CST think that everyone know which are the FACTS and which are FALSE. As a "Mahasiswa Hebat" we all can compared and know which are the true and the best for the future of our country. thank God and praise Allah I finally read something accurate and Factful about lynas. well done. good luck with everything and I hope you start the processing soon. praise allah the almighty all seeing god in the sky watching over us all and protecting our families and loved ones with the truth. I can now sleep at night as the almighty allah has touched the CST with the finger of truth and may he slay the ones not telling the truth. May he bare his vengeance upon them and take their eyes until they can see the truth. terima kasih di atas komen saudara saudari.di pihak CST,CST gunakan hak berfikir sebelum hak bersuara.CST yakin dgn perjuangan yang ada sekarang kerana CST tahu mana benar & mana mungkar.CST sentiasa salurkan fakta & kebenaran untuk sama-sama kita berfikir.Terima Kasih.